Back in the late 90’s and early oughts, I used to bump into a well known survival expert named Jeff Randall. If you know Jeff you know he doesn’t tolerate much but he zeroed in pretty quickly on the work I was doing in war zones. We became fast friends and spend many a long night discussing the business of adventure. We would meet up at the Soldier of Fortune convention or the SHOT show back when real mercenaries, militia members and clandestine folks used to gather around the pool and tell stories. 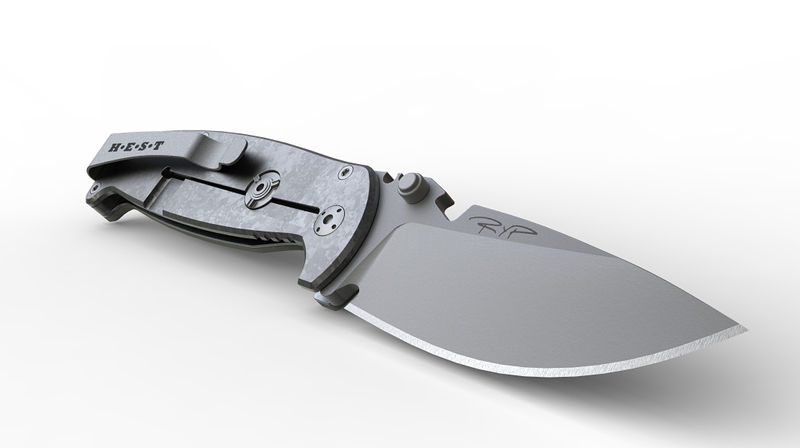 One of the things Randall kept pestering me about was designing a knife; something I had never really thought of, despite being a product designer and marketer in my past career. The original prototype for what would launch a entire knife business. In my travels to conflict, I was more of a “local screwdriver in a bag” kind of self defense carry or a “cheap locally made knife that I could ditch before flying” type. Randall is an expert on survival training and ran classes in the Peruvian jungles for pilots. Since then, he has branched out into just having fun doing ditch medicine, wilderness, rope and caving type classes. 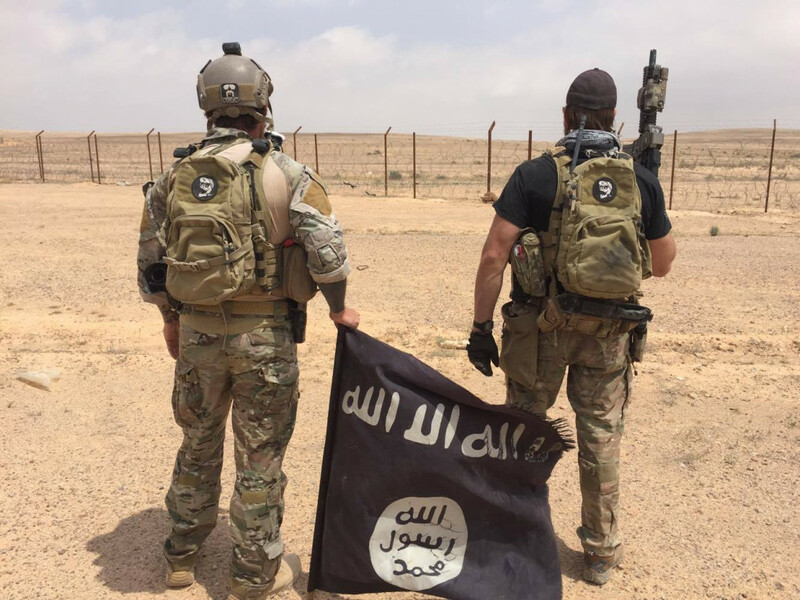 I stuck to entering conflict zones and doing missions with U.S. Special Forces in Afghanistan, accompaning South African mercenaries in Somalia fighting pirates and being on the front lines in Libya in Siirt as local militias wiped out ISIS. Each trip was an education on what worked, an what was superfluous. By 2008, and after ten years of pestering by Jeff, I thought I would give the idea of designing a knife a shot. I knew that the first rule of survival is not to get into trouble. The second is to make sure you actually have your survival tools with you if you need them. That meant they had to be small, easy to carry and multi functional. If you really needed a survival tool, it can’t break. This meant the classic Swiss Army Knife or ten dollar gas station knife might cause you more harm than benefit if it broke under hard use. 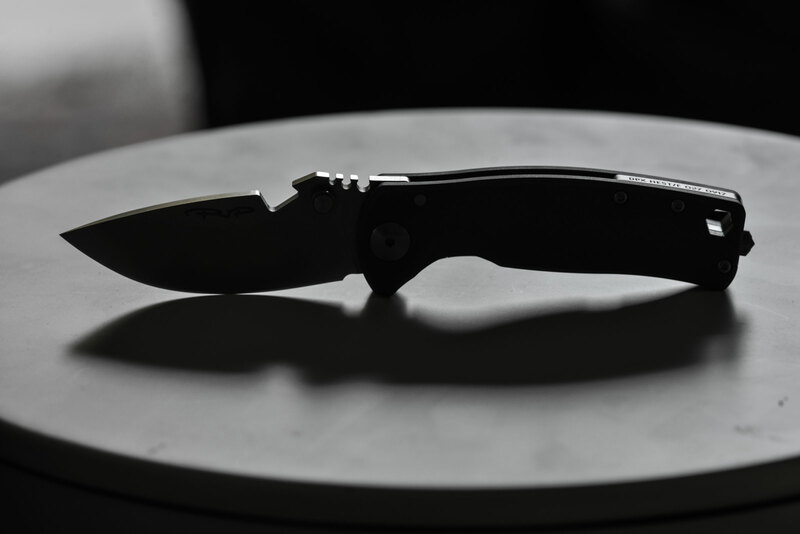 A key part of all our knife designs is the concept of self confidence; that the tool you bring will perform the job when you need it the most. 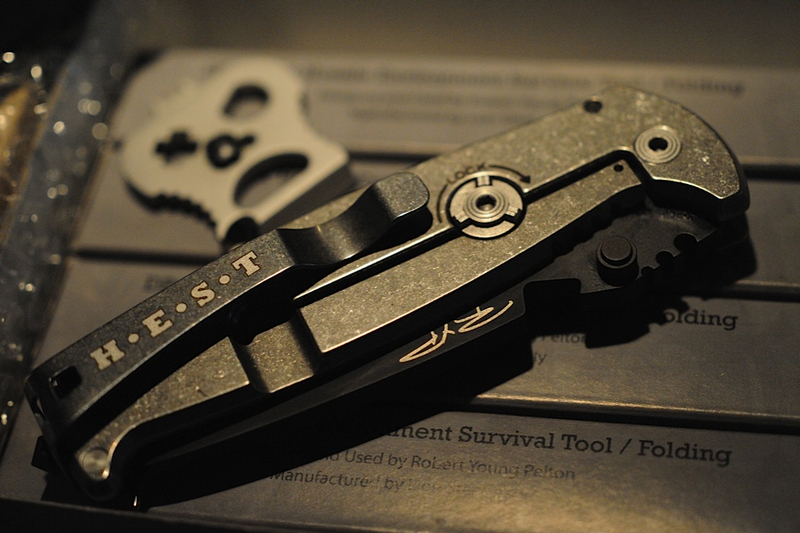 I decided to call it the HEST, short for “Hostile Environment Survival Tool” – a knife that could be useful in the wilderness as well as for self-defense. When I was ready to show my design, Jeff was surprised at how compact the knife was. The HEST also had a number of features not found on simple knives. It was beefy, thick and indestructible. I made it out of spring steel, the kind that locals make machetes out of. I refined its finish by enlisting the skills of Shon Rowen, who had perfected a heat treat on the famous high carbon 1095 steel. 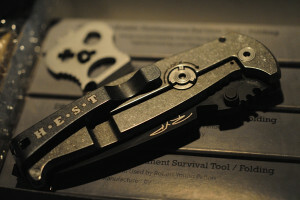 H•E•S•T stands for Hostile Environment Survival Tool. Just one minor change like the pry bar can add numerous features and benefits to a survival tool. The two hole provide lashing points and light weight while the pry bar allows the knife to be hammered, saves the tip and is an ideal non lethal self defense tool. 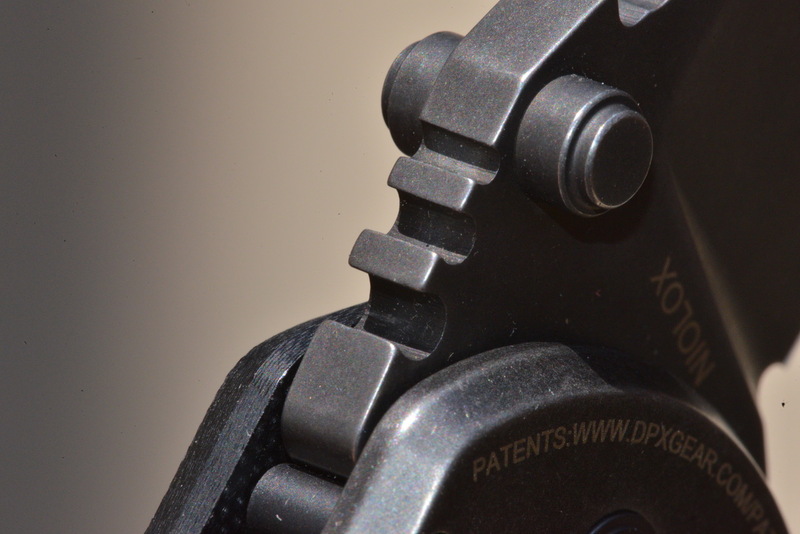 The DPx Gear HEST Original was only four and a half ounces, under eight inches long and was designed to be affordable. Every square millimeter of the knife was examined for usefulness, ergonomics and function. The handles could be removed revealing a hidden storage compartment. The sheath came with a washer designed to remove the scales. The blade was hardened to Rockwell hardness 58, which allows for stropping or field sharpening, much like professional butchers use high carbon steel instead of exotic harder blends. Small but tough. The best survival tool is the one you actually have on you when you need it. There are holes integrated to both lighten and balance with the most unusual feature being the pronounced pry bar where the pommel is. 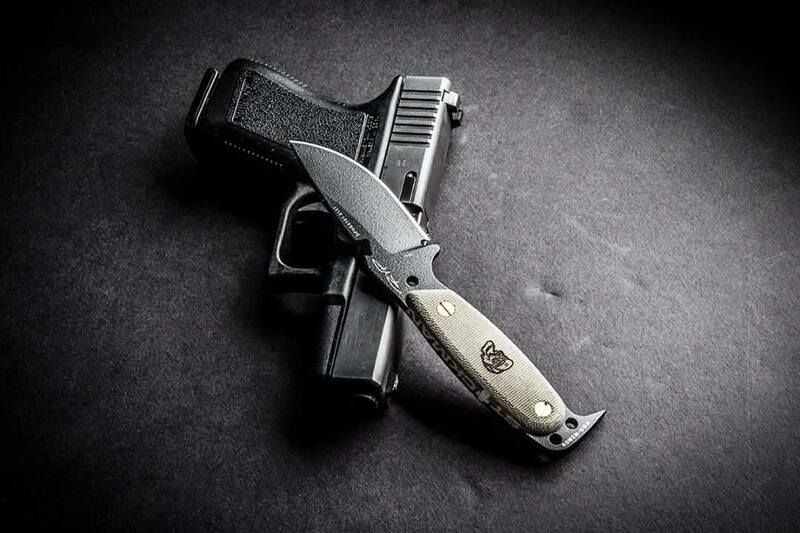 This allows the HEST to be hammered like a chisel, and provides a reverse grip, a non-lethal concealed grip and quite the nasty surprise for back alleys. The blade has our patented notch for opening bottles, lifting pots and lashing. The Original continues to sell well and is a knife that has made a lot of friends from professional Bear skinners to Army EOD. 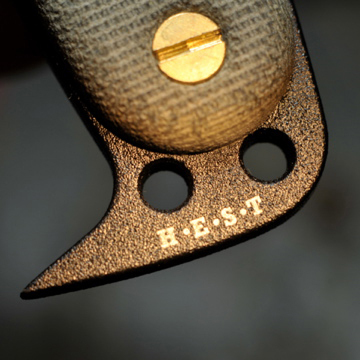 The HEST Original has fans among the military, LEO and even big game hunters. Experts who know why a Shon Rowen heat treat on 1095 is the professionals choice. 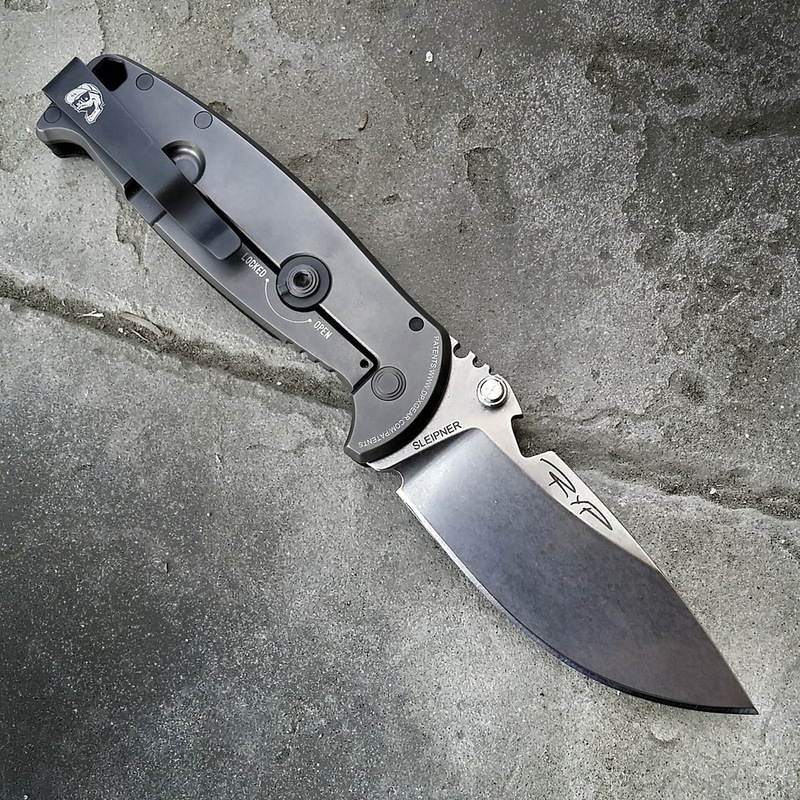 The HEST folder is simple, overbuilt without a single wasted feature or curve. 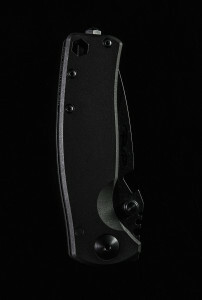 It is also ergonomically designed to fit in the hand as a self defense tool. 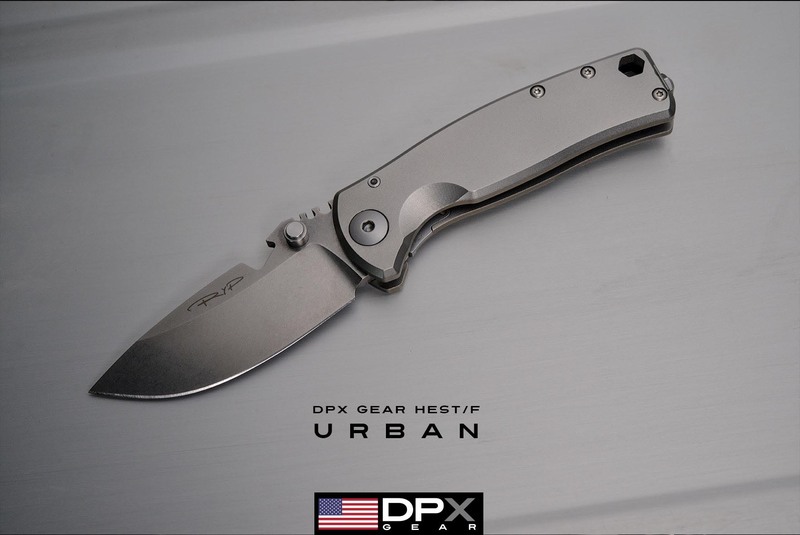 The DPX Gear HEST/F Folder. 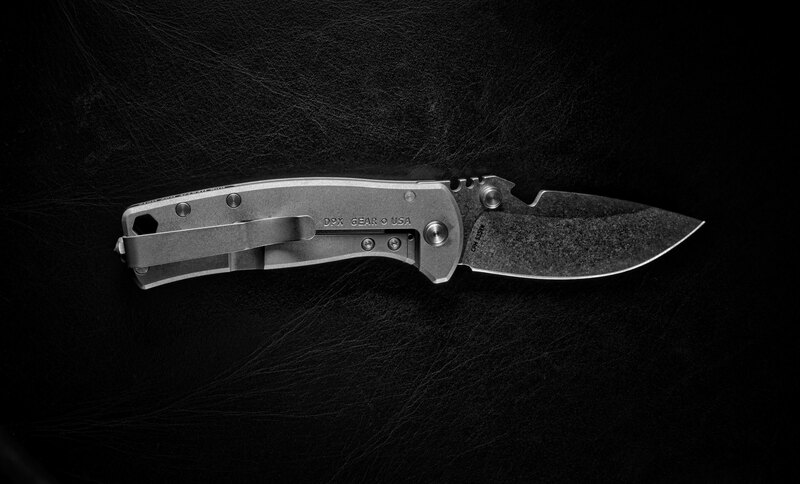 In 2010, I had sold enough HEST blades to learn that folders are where the real business is. Traditional fixed knives are important tools but folders, well they are a work of art. At this point, my neophyte entry into knife design needed help. I leaned on Tom Novak, a young outdoor enthusiast and fan to enter the world of engineering and digital design. Both Tom, a self-taught expert and his talented designer twin brother Andre would later come to work as a team to take concepts to 3D drawings, to digital rendering, then 3D printouts and then finally prototypes that I would take to the rough zones to test. A three dimensional renderings of the DPx HEST/F to test with customers. We wanted to retain the ergonomics and function of the fixed HEST in the new folding HEST. I also wanted the frame and blade over engineered and over built. In my years in the bush as a lumberjack and on various expeditions, I was not a fan of folding knifes due to the horrific injuries they can create and the multiple failures. The choices of materials for the frame side were easy. A thick but light slab of aviation grade Titanium was an expensive, but perfect material as the back bone of the HEST. on the other side, instead of using a liner and a scale we went with a thick slab of phenolic laminate in a rough grip. Lighter than using all Ti but well within the requirements I set. The next task was to design a blade of equal thickness, but stronger. A high carbon German D2 tool steel was chosen. 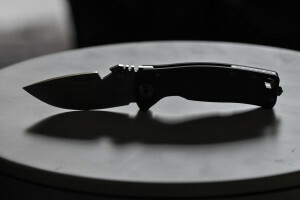 The knife would hold an edge and still take a razor edge for tough tasks like skinning and dirty work. To make sure the knife could not collapse, I introduced an idea in development by Rick Hinderer called a Roto Block. Very similar to a gun safety. Once the dial was turned to “lock” it is physically impossible for the blade to close on the user’s fingers. I put a lot of usability into the folder design like jimping that worked with gloves and wet hands, but also functioned as wire strippers for household, automotive and thin detonation wire. I had worked in tunnels blasting and always wanted this feature. The most serendipitous discovery was how well the potholder/opener in the blade worked as a rapid opener. 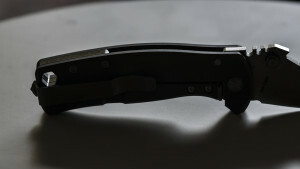 The idea that a knife must open faster than an automatic and to the rear is important in hostile encounters. After a few times opening the DPx Gear HEST/F flippers and autos seem painfully slow and awkward. 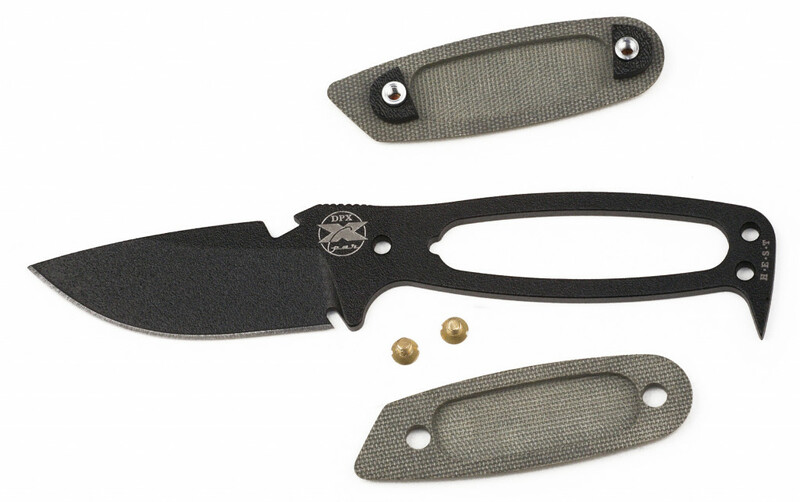 The Milspec version of the DPx Gear HEST/F folder features Sleipner steel. A proven hard cutting tool steel formula that keeps on slicing and still can be sharpened in the field. We chose this unusual steel because it has proven itself in the meat processing industry where blade sharpness is measured to the penny. Simple things like converting the lanyard hole into a standard hex driver was overlooked by most, if not all, knife makers. Designing features like a deep carry clip that fit on heavy pants or military gear that had the exact amount of tension for rapid deployment was easy. The trick was designing the whole system to be held on by a stout enough screw that doubled as a glass breaker (complete with Tungsten Carbon insert). More implementation of ideas that came from hard time in the field. 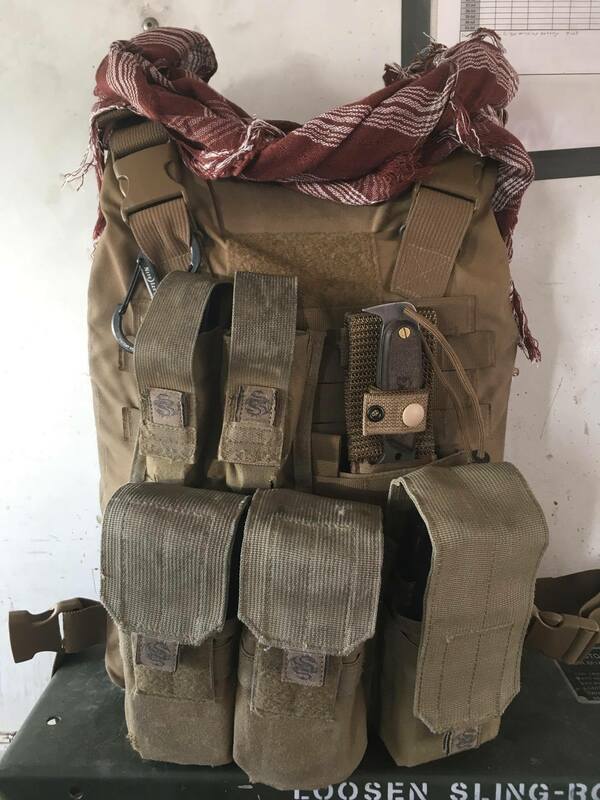 Finally, what made DPx Gear unique was not only were these knives tested in places like Borneo, Somalia, Afghanistan and other hard use environments, but that I keep tweaking them to get it exactly right. Real lasting customer service is also part of that long term commitment to our customers. Paying attention and respecting customer input again helps us modify, design and built better and better products, by having constant input and feedback. DPx Gear takes pride in starting everyone of our designs in the field. Only once I can fully feel comfortable that our customer gets everything they expect, do we go into production. So next time you are in Syria, Somalia, Iraq, Afghanistan or any other areas where our customers work. Look for Mr DP. The DPx HEST/F 2.0 is a German D2 tool steel folder mated to a U.S. made Titanium alloy frame with a durable American G10 scale assembled by the craftsmen at LionSTEEL in Northern Italy. 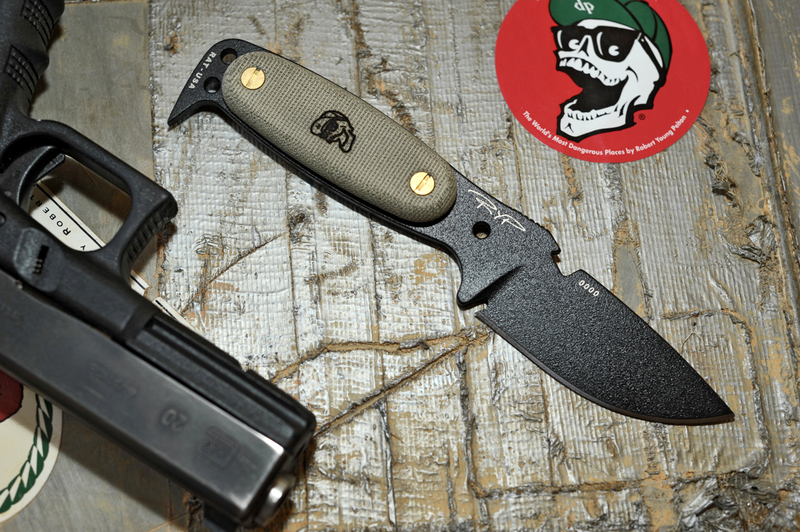 The HEST/F was developed as the direct folding version of the HEST fixed blade knife and was dubbed the 2.0 because there were a number of significant modifications made to the original design of this brutal use folder. The goal was to increase strength without adding weight and to directly address concerns about ease of opening, “strength of lockup and usability. 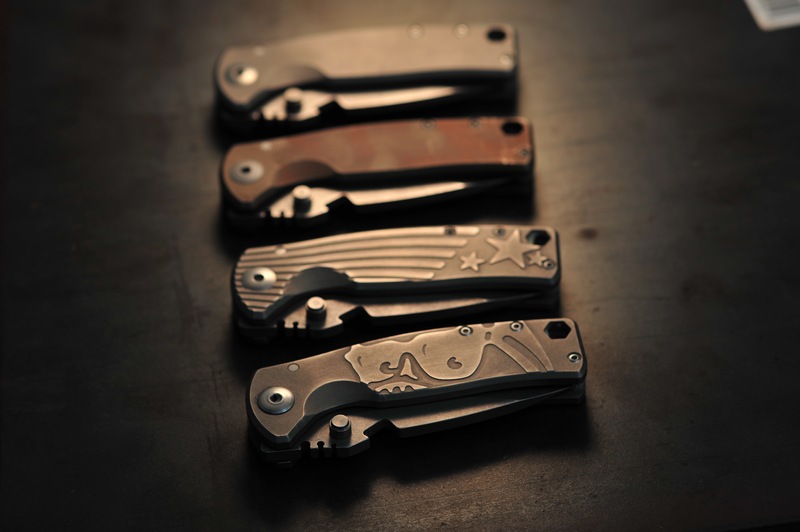 The Original DPx HEST/F Urban Kickstarter Campaign Models: (T to B) Sterile, Bronze, America and Mr. DP Editions. 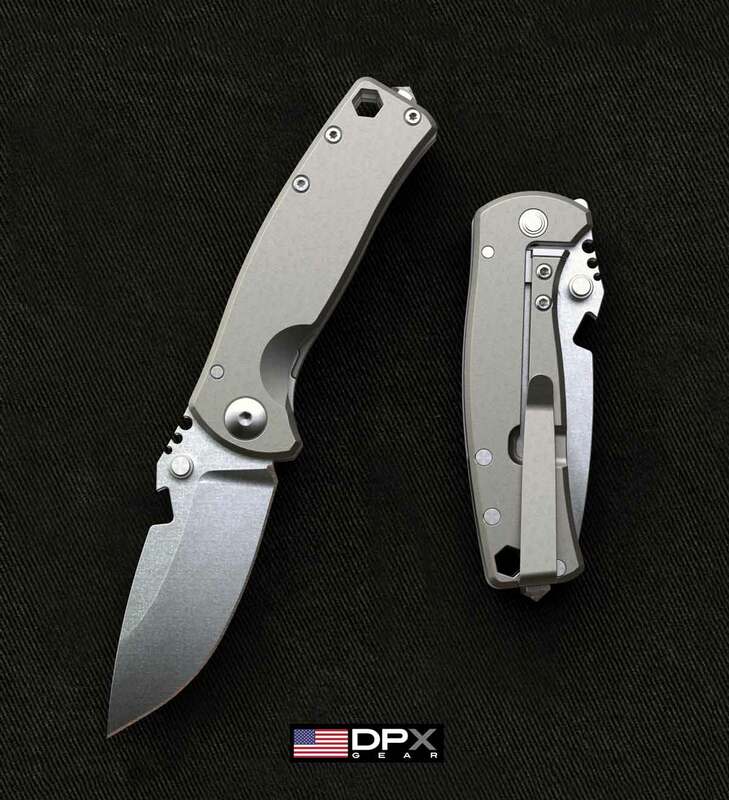 How do you transfer the rock solid confidence the DPx Gear Original provides in a small urban friendly folder? Easy make it stronger. As you can imagine, as soon as you announce a product you insist is perfect, the requests for something different begin. I had designed the HEST series for my large hands and less than gentle use of gear. I actually built in the idea of patina into every material and finish. 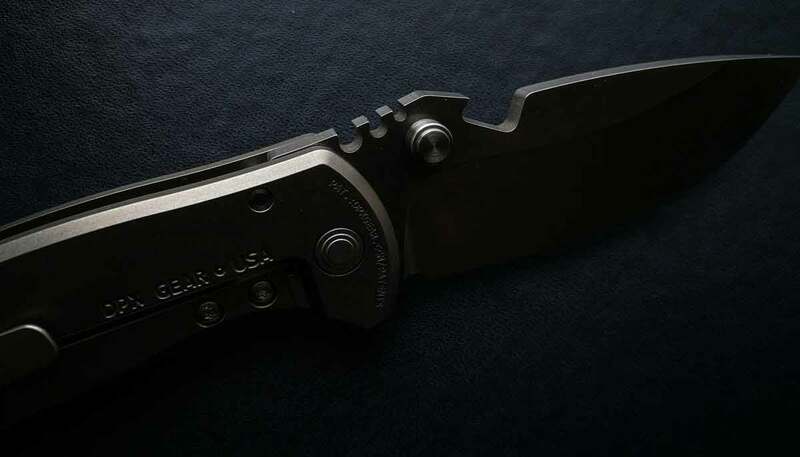 There are many DPx Gear HEST owners who brag on just how beat up and beautiful their blade is. 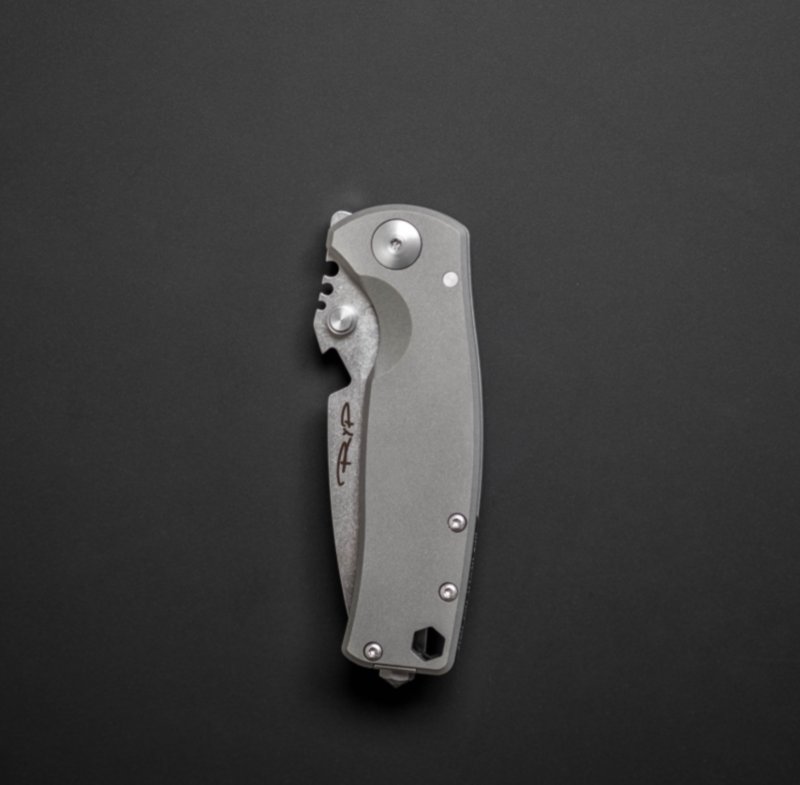 What I was missing was the trend for people who want a smaller knife, one that fits within legal carry city limits which is roughly a three-inch blade. 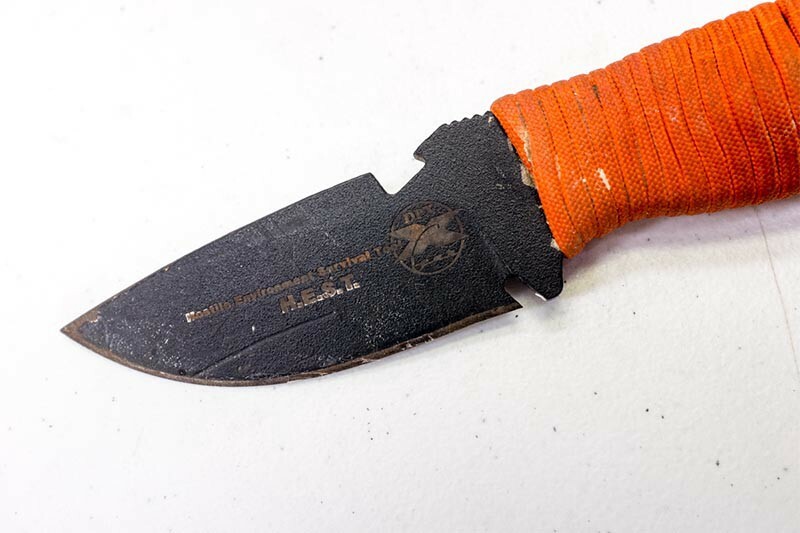 These knife fans didn’t foresee any trips into Yemen or Syria, but wanted some of the cachet that comes with products used by U.S. Special Forces, first responders and expedition leaders. With some hesitation, I set about shrinking down the DPx Gear HEST/F 2.0 into what became the DPx Gear HEST/F Urban. I refused to shrink overall strength and thickness ratios, but I did want to upgrade the materials where possible. I also wanted input from the target audience, so we went to Kickstarter in an innovative campaign to both insert consumer ideas and gauge response. The final product was a tougher knife than it’s big brother. 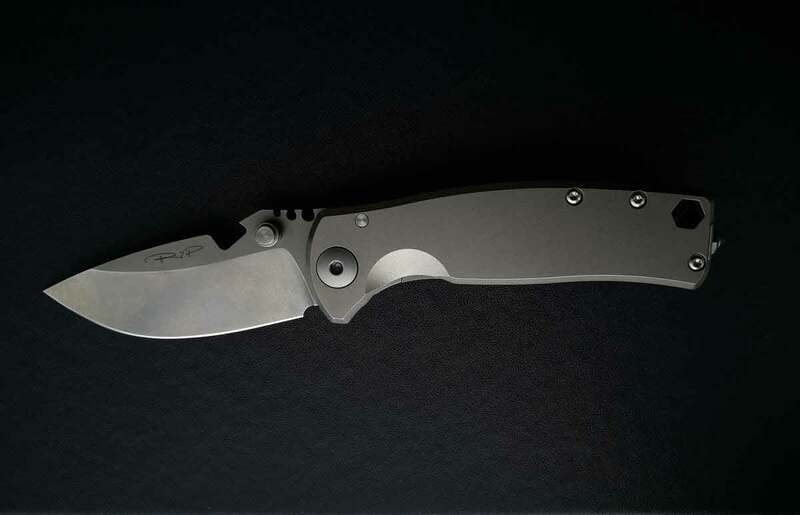 At only 3.35 ounces and with marginally thinner frame and blade, the Urban was small and tough. Adding things like a caged bearing system and all American hardware and manufacturing also made the knife a hit. 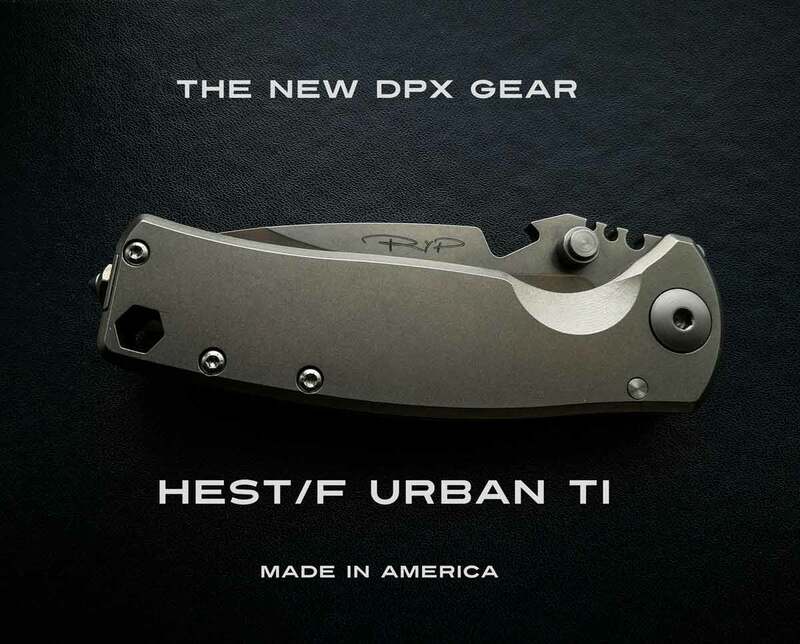 So now the DPx Gear HEST family is comprised of the Original Fixed Blade, the HEST/F 2.0 folder and the compact Urban series. 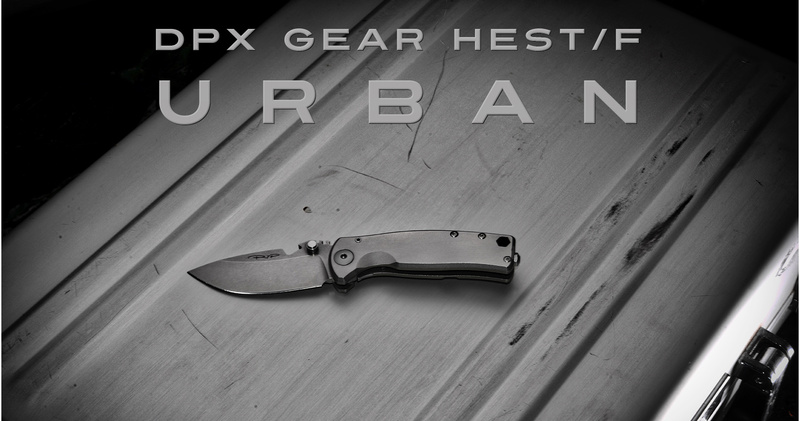 The DPx HEST/F Urban is the last pocket knife you’ll need for every day carry. 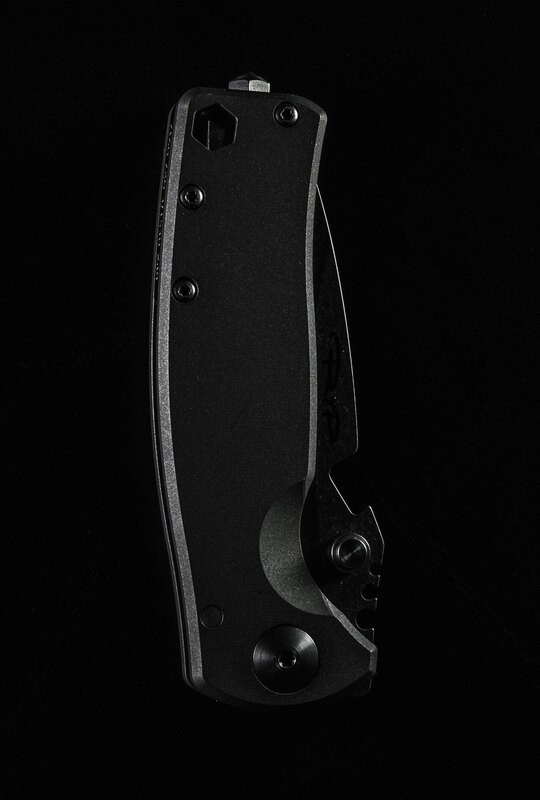 Fully reversible, deep carry pocket clip. 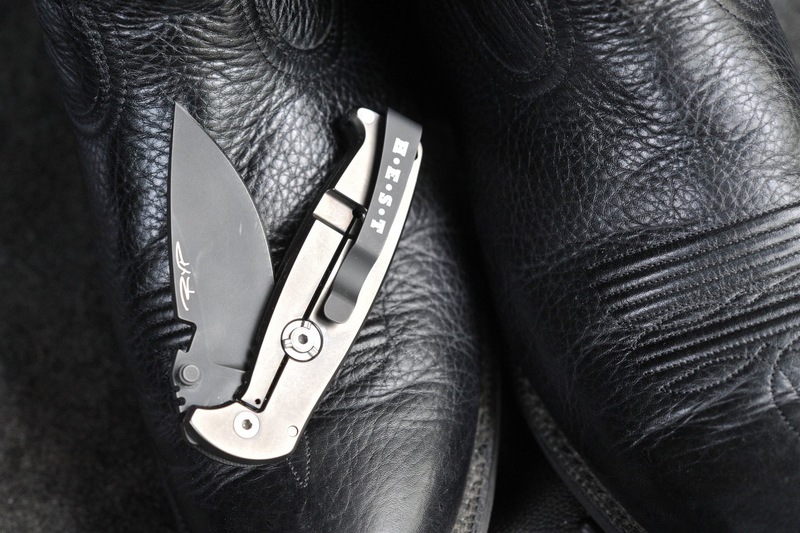 A deep pocket clip means your pocket knife rides as low and unobtrusively as possible in your pocket. The angle of the clip over the frame lock adds additional support to the lock. 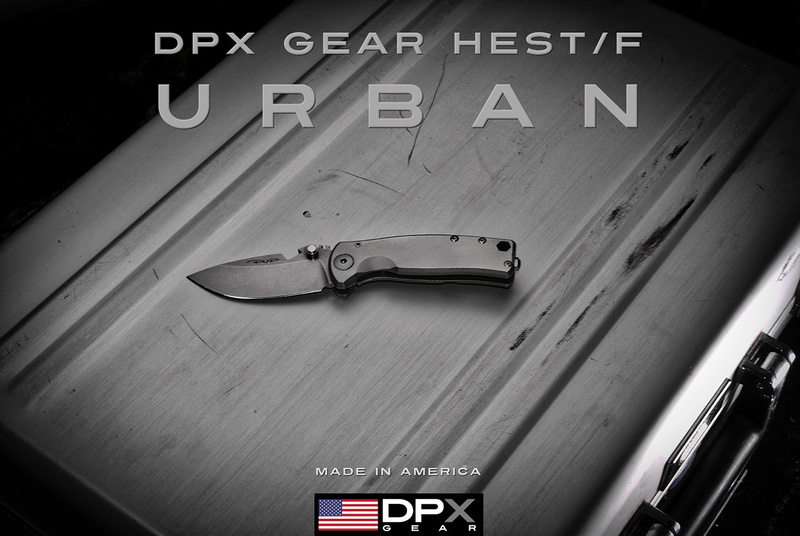 The DPx HEST/F Urban is made from not just durable materials but stain free materials. 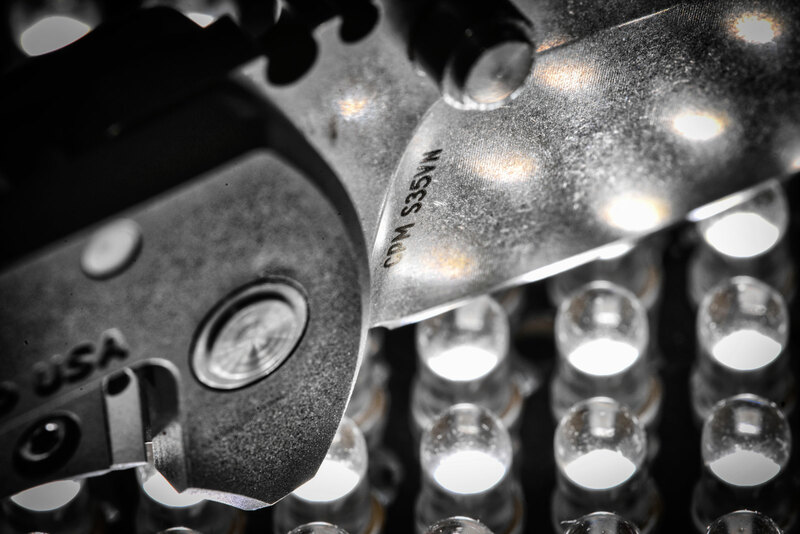 Even the clip screws and hardware are designed to take harsh environments with ease. 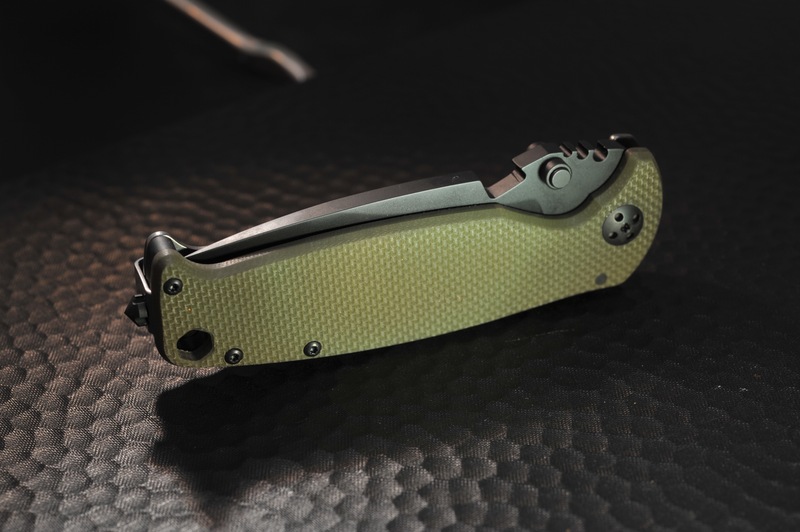 A U.S. invented tested and proven frame lock has become the standard locking feature for high-end custom knives. We added a stainless steel cap to reduce wear on the lock face.